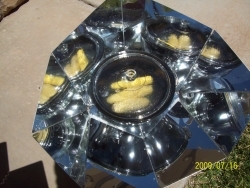 Here is a list of more Solar Cooking Tips, ideas, suggestions, tricks and helps to get the most effective results from your solar cooker. 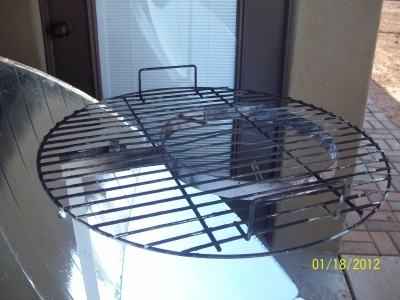 Use an old bbq grate on your parabolic cooker pot receptacle for greater stability and security of your pots and pans of all sizes. 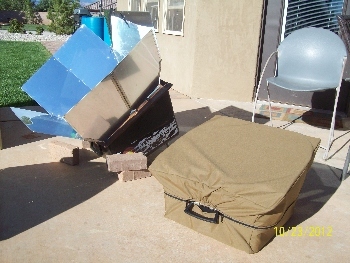 Add reflective "booster" panels to your box and panel style solar cookers by making additional light weight reflector panels that you can clip onto your solar oven. 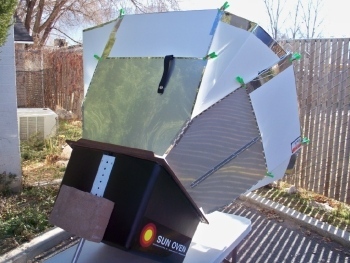 This will give you an added "boost" or capacity to your existing solar oven panels and increase your temperatures by 5-20 degrees, increasing your cooking speed and capacity. Add anchor points to your solar cookers so that you can secure them with rope, string, wire or bungee cords for greater stability and security in windy conditions. To gain greater insulating capability on a cold day with a Hot Pot solar cooker you can wrap the whole glass/steel pot inside of a large oven roasting bag which will give it an added layer of insulation against breezes and the cold. 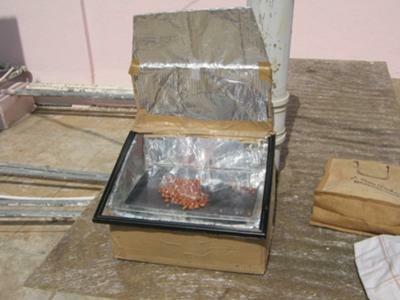 Store your Solar Cooker where it is easy to access and place in the sun with very little effort. Just inside of the garage, back door, carport, shed etc. so that you don't forget about your cooker and fail to use it and take advantage of the free energy from the sun. Too many people get a solar cooker for "emergencies" and fail to use them when they are just as easy to use on a daily basis as it is to fire up the bbq grill or turn on the electric stove. If you can find a Lazy Susan you can sit your solar ovens and panel cookers on them for easier rotation and tracking of the sun. Some people have converted old swiveling office chairs on which to place their solar cookers, and they not only rotate, but they also roll well across hard surfaces. If you have troubles with your parabolic cookers burning the handles of your pots/pans you can prevent this by wrapping the handles in aluminum foil, or you can remove the handles all together. If the temperatures of your parabolic cooker are too high, or intense, for the food that you are cooking you can mitigate the heat by laying a grate on the pot receptacle before placing your pot or by using a "heat plate" or "heat sink" which can reduce the overall heat that reaches the pan, thus allowing you to simmer, or slow cook. Set your cookers out to preheat whether you are ready or not with your prepared ingredients. Set your ovens out towards the sun and then go and decide what you want to cook and this way you will already have the advantage of a preheated cooker. Set water out to preheat for foods that require such and it will reduce the time heating up the water later for your pastas, rices, potatoes etc. when you do boil. Even on partly cloudy, or high-thin cloudy days you can still use your solar cookers for warming/heating foods such as leftovers, canned soups, stews, veggies etc. Most of these foods are already pre-cooked and do not need temperatures much higher than 200 F to thoroughly heat them up. Do not try and bake on cloudy days. High thin clouds will reduce your temperatures quite a bit and the results will be less than ideal. If it is an intermittently cloudy day, where the sun is out more often than it is covered, then you can usually do alright with baking. Cut down on condensation inside of your solar oven by wrapping your pot/pan with food inside of an oven (turkey) roasting bag when cooking very moist foods. Cook a dozen eggs in your solar oven inside the egg carton, no need to put them in a pan...no water either. Solar cook your corn on the cob with the husks on, or shuck (peel) the corn and place it in a pan with or without water; all three methods do fine for corn on the cob. Use only heavy-gauge cookware on a parabolic cooker (preferably dark in color) and use thin-gauge and dark cookware in your solar ovens and panel cookers. Parabolic cookers have such an intensely hot focal point that any thin-gauge cookware will scorch rapidly and burn your food. Solar Ovens have a more even, but slower heat which makes dark, thin-gauge cookware ideal for transferring heat to the food more quickly. Use lids on pots/pans to reduce or eliminate oil and grease splattering on your parabolic surface. Cook your veggies with very little to no water in a solar oven or panel cooker. They already have quite a bit of their own moisture content and so do not need to have much water added. Too much added water can extend your cook time due to more added mass that needs to heat up. Some veggies that tend to dry out more when cooked do need added water. Angel Food cakes can be cooked in a solar oven that can attain at least 325 F, and it will cook it very well if you divide the batter into separate smaller pans, where as a large pan with all of the batter can take longer and does not always turn out as well. Cover your cookers that are stored or left outside in order to avoid excessive exposure to the elements and dirt. Cleaning of aluminum reflector panels is easy enough with a common window cleaning spray, but if panels have caked on food or grime then it is best to use hot soapy water with a soft non abrasive cloth. Aluminum and vinyl covered reflector panels of a parabolic are easily cleaned using hot soapy water with a soft rag in order to remove grease splatters and and dried on spilled food spots. It is even recommended to spray your parabolic panels with water to remove dust and dirt rather than wipe off the dirt with a cloth since the dirt/dust can be abrasive on your reflective surface. Clean spills right away, or as soon as you finish cooking, in order to maintain a clean and hygenic cooking surface. This will also help to avoid the difficult task of cleaning up dried and stuck food. Your Sun Oven needs protective wood oil for the collar of the unit in order to avoid splitting and wear from the elements. Do not use glass cleaner on lexan lids and covers such as is used for the SOS Sport Oven it will cause chemical streaking. Glass cleaner is fine for glass and polished aluminum panels. Protective Covers will help to preserve your solar cookers for a lifetime of use by keeping them safe from dents, scratches and dirt and moisture. Some people use tarps or fashion their own covers from various materials. You can also see our own heavy duty Sun Oven and Parabolic Cooker Protective Covers. 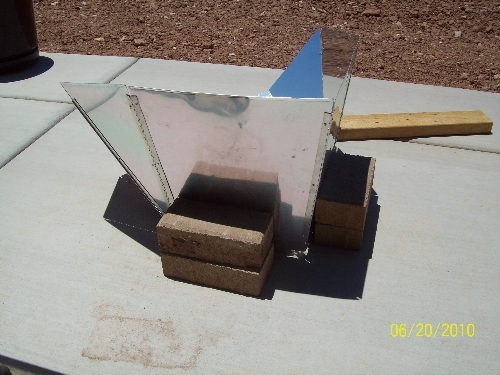 For persistent solar oven odors read our page on "plasticky" solar cooker smells.